It's summer in the market town of Camlann and the year is 1376. Come visit Camlann on a living history day and immerse yourself in the lives of its folk. Wander around the peacefully green village and stop in to talk with the village cook, the potter, the clothier, and the rest of their neighbors about life in the 14th century. Each has a craft that they can teach you and -- if you show promise! -- will let you try. If you're more adventurous why not taste medieval fare at the Bors Hede Inne, which serves a peasant menu lunch from 12 to 3pm and a more noble dinner (by reservation) after 5pm. The villagers are all volunteers, and the presentations vary from day to day depending on volunteers' availability. These presentations include: the innkeeper, the inn cook, the litster, the huswife, the potter, the blacksmith, the carpenter, the basket weaver, the weaver, the spinner, the seamster, the games mistress, the midwife / herbwoman, the scribe, the archers, and the chandler. Open Saturdays and Sundays from 12-5 from May through September. Admission: Adult $10, Junior and Seniors $7, Children 15 and under are Free. St. James Faire is a regional event, pulling villagers and nobles alike from the surrounding area for knightly combat, villager markets, poppets, minstrelsy, Payne's Magykes (listen for the crowd to chant "Oh no! Not the ram's bladder trick! 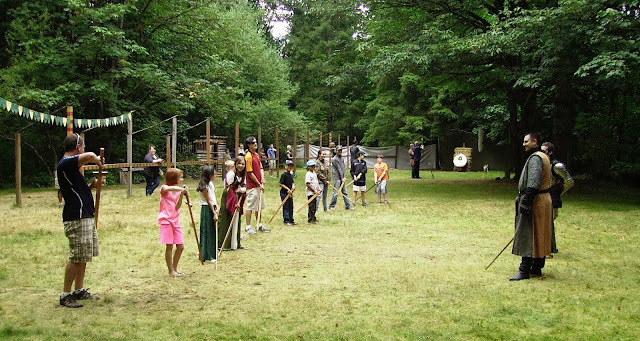 "), archery demonstrations and dance. July 28 and 29. The next big festival is Harvest Festival, August 25 and 26. Camlann Medieval Village 10320 Kelly Road NE, Carnation 98014. From the Carnation - Duvall Road, turn at Stillwater (which is a small store / gas pump). Updated 7-16-18 The plural of staff is "staves"